A three-member federal appeals court panel heard arguments Thursday for delaying California's recall election on the grounds that thousands of voters might be disenfranchised by the use of unreliable punch-card ballots. Three civil rights groups want the election delayed until next March, when newer and more reliable voting machines will be used throughout the state, reports CBS News Correspondent Steve Futterman. The groups predict at least 40,000 votes in six counties will not be counted because of the machines. Supporters of the recall told the judges that no election is perfect and pointed out that the punch-card machines have been used for decades and as recently as last year. The legal challenge echoes problems with "hanging chads" in Florida during the 2000 presidential election. 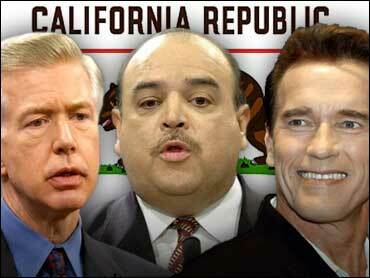 It appears to be the last major legal challenge that could halt the Oct. 7 election on whether California Gov. Gray Davis should be recalled. U.S. 9th Circuit Court of Appeals Judge Harry Pregerson said in court it was clear that the California secretary of state had found the punch-card system, still used in six counties, unacceptable because of errors. The six counties are already under court order to replace them by March. "Does this mean that we have to accept the unacceptable?" Pregerson asked a lawyer arguing that the election should go forward. Thursday's hearing was held to consider an appeal of an Aug. 20 ruling by U.S. District Judge Stephen Wilson, who said he would not delay the recall election because it would be acting against the will of the people. The appeals panel heard nearly two hours of arguments Thursday. It did not say when it would rule. The questioning by the judges was so challenging that the attorney representing the secretary of state, Doug Woods, asked at the end of his presentation that he be given time to seek further review from the U.S. Supreme Court if the appeals court halts the election. American Civil Liberties Union attorney Mark Rosenbaum, who brought the challenge on behalf of the NAACP, the Southern Christian Leadership Conference and the Southwest Voter Registration Education Project, said there are "grave federal interests" involving the federal Voting Rights Act and potential discrimination against poor and minority voters who may have difficulty with the punch-card ballots. "Their votes will not be counted," Rosenbaum said. "Not only do we have vote dilution in these 40,000 cases, but we will have disenfranchisement." The six counties planning to use punch-card ballots Oct. 7 are Los Angeles, Mendocino, Sacramento, San Diego, Santa Clara and Solano. The 40,000 voters cited by opponents represent a possible number of excluded votes as calculated by an expert in election procedures. On the campaign trail, Arnold Schwarzenegger staged his second policy summit of his recall campaign, focusing on education, an issue voters rank among the most important. Like his economics summit, which featured billionaire investor Warren Buffett and former Secretary of State George Shultz, Wednesday's education forum was a brain trust in the field. The participants included superintendents; Jaime Escalante, a former East Los Angeles math teacher portrayed in the film "Stand and Deliver"; and Eunice Kennedy Shriver, Schwarzenegger's mother-in-law and Special Olympics founder. "Education has been always a passion of mine," said Schwarzenegger, the leading Republican replacement candidate. "What we want to accomplish here in California is we want to get our education straightened out." Lt. Gov. Cruz Bustamante, the leading Democratic replacement candidate, came under renewed attack Wednesday for exploiting a loophole in campaign finance laws that allowed him to fill coffers with large donations from Indian tribes and unions. The lieutenant governor announced over the weekend that he would use those donations to fight a ballot initiative that seeks to limit what racial data the government can collect. He said the initative, Proposition 54, would undermine civil rights enforcement by stopping the collection of statistics that could show patterns of discrimination. Proponents of Proposition 54 argue Bustamante's plan is a guise for campaigning and asked a campaign watchdog agency to take action. "I am so offended and disgusted by the flagrant fund-raising," former Fair Political Practices Commission Chairman Dan Stanford said in a statement. "I ask the FPPC to remove the 'for sale' sign from the lieutenant governor's office." Meanwhile, with the California GOP convention set for this weekend, many Republicans were expressing fears that conservative state Sen. Tom McClintock's campaign will split GOP votes and hand the election to Bustamante if Davis is recalled. McClintock is running third in the polls behind Bustamante and Schwarzenegger. Elsewhere, Davis bowed to growing pressure and apologized for poking fun at Schwarzenegger's Austrian accent. Davis triggered the flap at a union picnic Saturday when he said someone who couldn't pronounce "California" shouldn't be governor. "I was joking around with someone in the crowd after a speech," Davis said during an interview with KGO-AM radio in San Francisco. "I regret saying it, because I'd rather eat humble pie than have one Californian think that I don't fully appreciate, which I do, the role that immigrants have played in our society." Aides to Davis said former President Clinton will begin his long-awaited trip to help Davis fight off the recall election by joining him at church services Sunday in south-central Los Angeles. In an attempt to counter views that the state is unfriendly to business, the Davis administration held a conference call with reporters to release statistics showing entrepreneurs are still bullish on California.